When exactly does a holiday tradition become just that: tradition? Is it simply a matter of repeating an activity more than once? 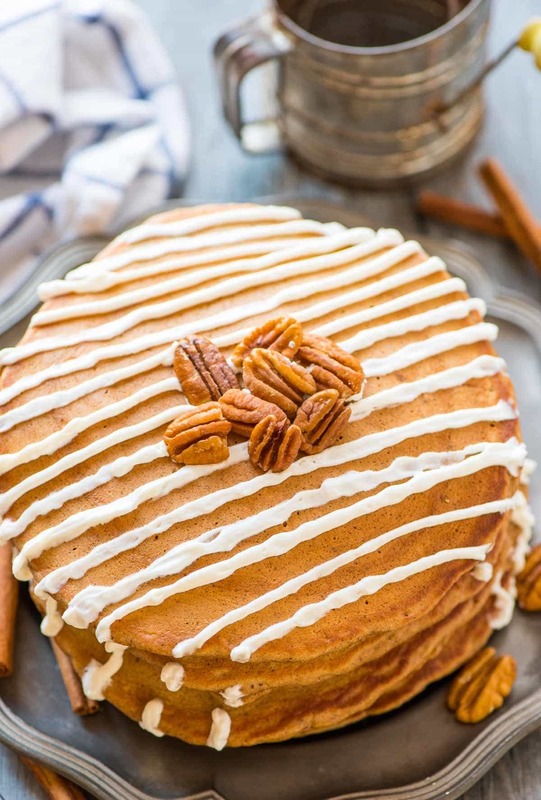 If yes, I vote we make these Gingerbread Pancakes three times from now until Christmas, so that come Christmas morning, we have no choice but to make them again, because, well, it’s tradition. Thick, fluffy pancakes spiced with cinnamon, cloves, and ginger, then smothered in a holiday-appropriate maple cream cheese drizzle, these homemade gingerbread pancakes are everything Christmas morning should be: cozy, sweet, and best enjoyed in pajamas. Dibs on the last Gingerbread Pancake if the pajamas have feet! In all seriousness, I have been thinking a lot about family Christmas traditions over the past few weeks. Most of my recent recipes—Shrimp Corn Chowder, Slow Cooker Scalloped Potatoes, Cranberry Orange Cookies, and more—were inspired by dishes that have been a part of my holidays since childhood. I’m not sure how or when they began, but now I can’t imagine our Christmases without them. Because we spend Christmas in Kansas with my family, Ben has been absorbed into our holiday routine. I think the first year of our marriage, when I presented him with a three-day eating agenda and the set menus that go along with it, he was a bit overwhelmed. He acclimated after two bites. I love our family traditions, and it means a lot to me that Ben is more than willing to embrace them. I’m also hoping that he and I can start a few small traditions with our little family of two. While Ben has yet to enthusiastically endorse my proposal to make our annual tradition an afternoon spent decorating cookies, sipping hot chocolate, trimming our Christmas tree, and cuddling on the couch (all in matching red plaid flannel pajamas while Love Actually plays in the background), we do have a handful of traditions that we plan to start or continue this year. One tradition we’re continuing is not to exchange gifts, opting for a special dinner out instead (that’s tomorrow!). A new one we are beginning is to cook a big breakfast together the weekend before we head home. 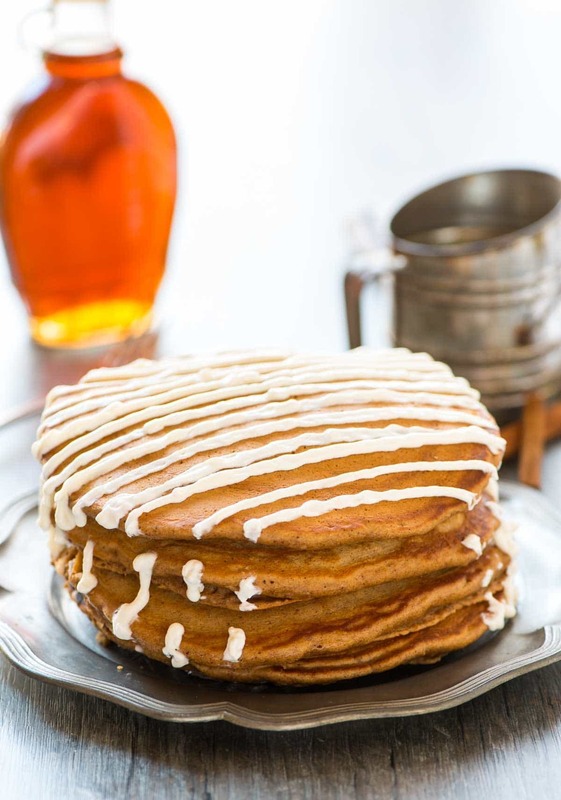 When I think of a special holiday breakfast, it’s hard to imagine a better choice than these Gingerbread Pancakes. They’re made with buttermilk, so they are extra moist, have loads of holiday spice, and are easy to make, so that you can enjoy time relaxing with your family, instead of stressing over a fussy recipe. I wanted to make the Gingerbread Pancakes without molasses, because I found that it made the pancakes too dense and heavy. To create the same rich gingerbread flavor, I added a bit of brewed coffee to the batter. You can’t actually taste the coffee, but it gives the pancakes just the depth I was seeking. I also snuck in whole wheat flour to make this a recipe for healthy gingerbread pancakes. Translation: you can feel great about that third (or fourth) Gingerbread Pancake you’ll be craving! 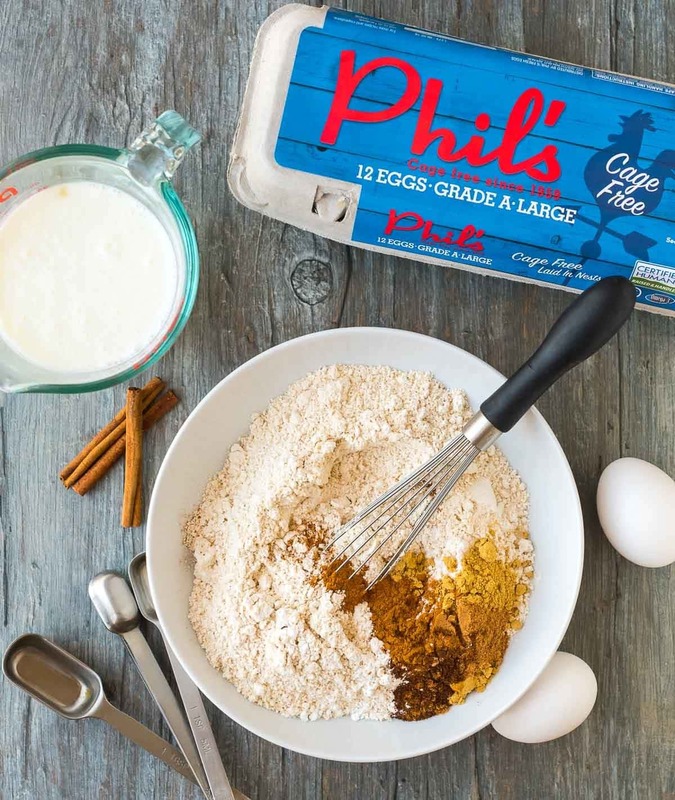 My final favorite Gingerbread Pancake ingredient is Phil’s Fresh Eggs. They have the bright, happy yolks, because they come from bright, happy chickens. Phil’s is a family-owned company and raises its chickens in a cage-free environment on the original family farm. I love Phil’s eggs for their quality, flavor, and the company’s humane practices. I used the eggs in the Gingerbread Pancakes, and I plan to scramble a few to serve beside our stacks as well. Do you have any special holiday traditions you’re looking forward to this week? If yes, I’d love to hear about them (and might even borrow a few too!). 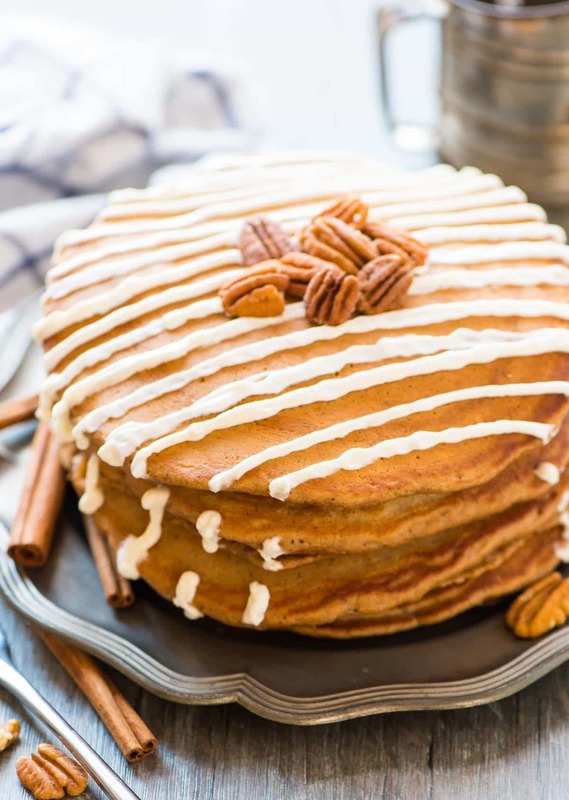 Soft, fluffy Gingerbread Pancakes with Maple Cream Cheese Topping. Tastes just like a gingerbread cookie! Easy recipe that's perfect for holiday mornings. In a large bowl, whisk together the eggs and brown sugar until well combined. Stir in the buttermilk and coffee. In a separate large bowl, whisk together the whole wheat flour, baking powder, baking soda, salt, cinnamon, ginger, nutmeg, and cloves. Make a well in the center of the dry ingredients. Add the liquid ingredients to the dry ingredients and stir gently, just until combined. You will have some lumps remaining. Stir in the melted butter. If you'd like to keep different batches of pancakes warm, preheat the oven to 200 degrees F. Heat a griddle or sturdy skillet over medium-low. Coat the skillet with butter or cooking spray to prevent sticking, then ladle 1/2 cup batter (for large pancakes) or 1/4 cup batter (for smaller pancakes) into the pan and begin cooking. Because these pancakes are whole wheat, they cook more slowly. Flip when the edges of the pancake are no longer shiny and some bubbling forms on top, about 4-5 minutes for large pancakes or 2-3 for smaller ones. Continue cooking on the other side for 1 to 2 minutes more. Serve the cooked pancakes immediately or keep warm in the oven. Repeat with remaining pancakes. For the maple cream cheese topping: In a mixing bowl, beat together the cream cheese and Greek yogurt on medium speed until well combined, about 2 minutes. Add the Greek yogurt, maple syrup, and vanilla and mix again. Add 2 tablespoons milk to thin the batter. Taste and add additional maple syrup if you desire a sweeter topping. If you desire a thinner consistency, continue adding milk 1 tablespoon at a time, until the topping is as thick as you like. Serve with warm pancakes. Leftover pancakes can be wrapped tightly and stored in the refrigerator for up to 2 days (reheat gently in the toaster) or frozen for up to 3 months. Let thaw overnight in the refrigerator. Recipe can easily be doubled to feed a larger crowd. I am sharing this post in partnership with Phil’s Fresh Eggs. As always, all opinions are my own. Thanks for supporting the brands and companies that make it possible for me to continue creating quality content for you. To learn more about Phil’s, you can visit its company website and Facebook page. What a PERFECT Christmas morning breakfast! 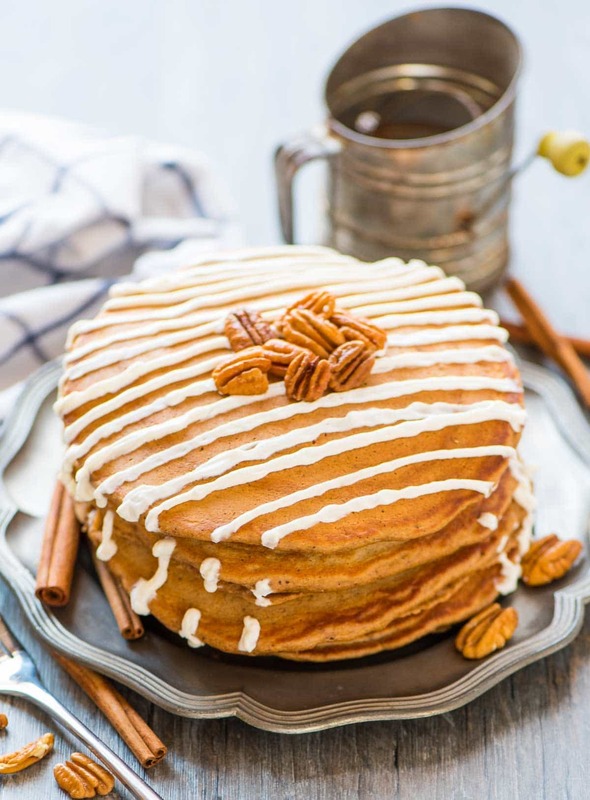 I love the idea of using coffee in these, and maple + cream cheese is wonderful just about anywhere in my opinion, especially on pancakes and French toast! Thanks for the recipe! Thanks so much, Margaret Ann! These made me start craving gingerbread this morning! These pancakes are sure to be outstanding! So great for enjoying during the holidays! These pancakes definitely cause cravings! Thanks, Robyn! The pancakes sound wonderful, although they are a mite heavy on the cloves for our tastes. I like that you and Ben have chosen not to exchange gifts. My husband and I are the same way. What we’ve ended up doing is, if we find a large purchase we want to make, we make it a gift to ourselves. It can be at any time of year. Your idea of dinner out is a very nice one. That might be one for us to adopt for the years when we celebrate Christmas at home. Years like this one we head out to visit my husband two sons and their wives and children, but when we’re traveling starting in January, we visit them just before we leave, and spend Christmas at home. Apart from that we have no traditions – my fault, since I’m not a fan of the holidays. Gingerbread definitely smells heavenly! :) Thanks, Alia! Hooray for new traditions! I’m so happy to hear you and your family loved the recipe, Laura. And I really appreciate your taking the time to leave this nice review! My husband and I also started the tradition of not giving each other gifts this year as we just decided we prefer “experiences” over gifts. I’m glad to hear that you guys do that too! Looking forward to trying this recipe. It’s a truly wonderful tradition! Thanks, Erin. I hope you enjoy the pancakes! Hi Michelle! I don’t have an exact substitute for the coffee. You could maybe experiment with strongly brewed black (or cinnamon!) tea. Otherwise, you could use milk or water, but just note that without the coffee, the pancakes will have a milder flavor. Thanks so much, Lindsay! I’m so glad you enjoyed the pancakes! I appreciate your taking the time to leave this nice comment and 5-star rating! I used an egg substitute and made my own “buttermilk” using almond milk and a splash of apple cider vinegar to make them vegan and they turned out wonderfully! I look forward to making these for my spouses breakfast on Christmas Eve. Thanks for reporting back and sharing your tweaks to the recipe, Sierra! I’m happy to hear you enjoy the pancakes! The kids absolutely loved this! Thanks for the post!! Awesome, Tony! I’m glad to hear the pancakes were a hit. Thank you so much for taking the time to report back!